Fancy Frontier is a comic convention much like Comic Market, except it's held in Taiwan. 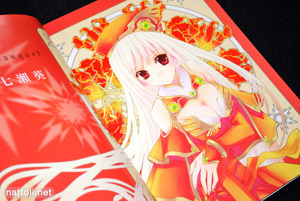 Even so, it attracts a lot Japanese artists who do exclusive art work for the convention, and Splendid Banquet - Taiwan Limited Illustrations is a great example of that. 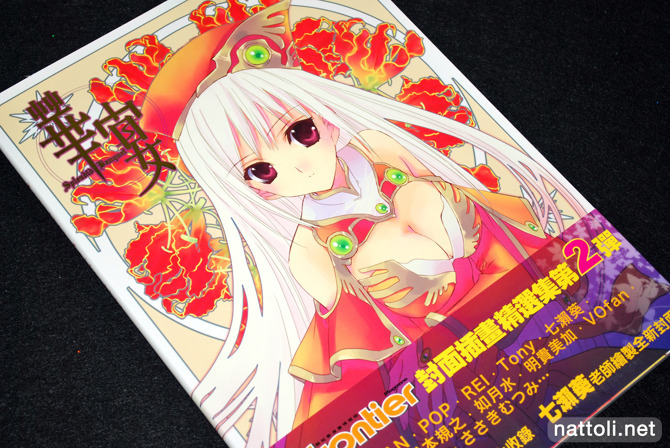 Artists like Aoi Nanase, Kisaragi Mizu, Tony Taka, Ramiya Ryo, REI, Amamiya Polan, Tokumi Yuiko, Mutsumi Sasaki, Noriyuki Matsumoto, and Carnelian have all done covers for the Fancy Frontier Magazine, and this art book collects their cover illustrations from 2005 through 2007. 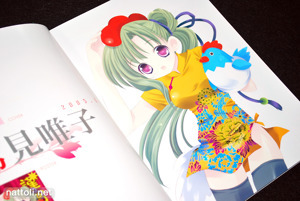 Splendid Banquet is an A4 sized art book and 112-pages in length of which 96 are in color; the rest is an index with content commentaries in Chinese from old issues of Fancy Frontier Magazine. 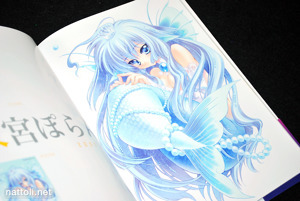 The cover art work is by Aoi Nanase, and it's gorgeous and reproduced inside over two pages. 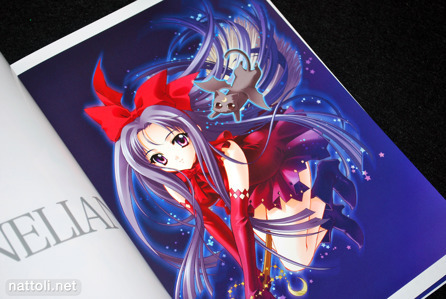 It's printed with page overlap, so the illustration lines up nicely when viewed. 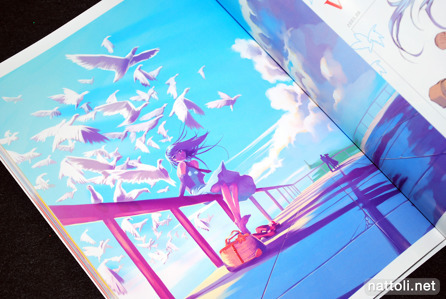 Each illustration is a full page, though the page next to it is mostly empty, occupied with only the artist's name and small image of the original cover or poster that the art work came from. 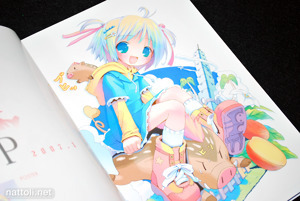 As a result, even though the book is 96 color pages, only about half that is illustrations. Splendid Banquet is divided into fives sections, each with a different theme; Festival Day, Summer Time, Uniform Girl, Maid and Fantastic. 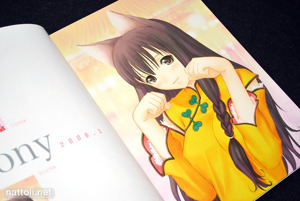 The first section, Festival Day features illustrations from Tokumi Yuiko (x 2), Tony Taka, Ramiya Ryo, POP, Aoi Nanase (x 2), Kisaragi Mizu (x 2), Carnelian, and Amamiya Polan. 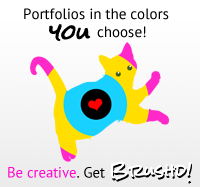 There are a few with a Christmas theme, some with a Valentine's Day theme, New Year's, and Halloween. Summer Time is a predictable category, where nearly everyone is wearing swimsuits except for Aoi Nanase's cover girl, who is wearing a sundress and enjoying ice cream. 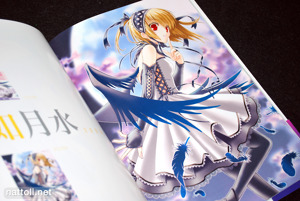 Tony Taka is featured twice, with Aoi Nanase, Tokumi Yuiko, and Kisaragi Mizu each contributing one illustration. Uniform Girl refers to school uniforms and includes just four illustrations; one each by Tony Taka, Noriyuki Matsumoto, Kisaragi Mizu, and Ramiya Ryo. Maid is a little longer, starting off with an illustration by Ramiya Ryo---whose art work really looks dated along side everyone else. Tony Taka illustrates two maids, with Tokumi Yuiko, Carnelian, Kisaragi Mizu and REI having one illustration each. 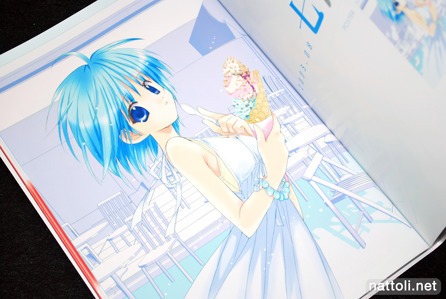 Also, all of Tony Taka's illustrations in Splendid Banquet can also be found in the T2 Art Gallery except for the maid illustration pictured above. 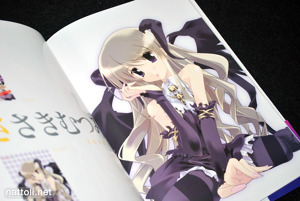 The final cover illustration section, Fantastic, focuses on fantasy characters with mermaids and girls with wings. 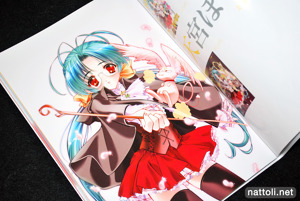 Amamiya Polan has two illustrations, with Kisaragi Mizu, Mutsumi Sasaki, REI, and Akitaka Mika having one each. Since the collection consists of cover illustrations, the quality is pretty consistent through out with so many talented artists participating. Ultimately, it does feel a little light with the illustrations on every other page for the most part, but this is a case where I was more sold on it because of the artists that would be in it. Splendid Banquet - Taiwan Limited Illustrations was sold in Taiwan during Fancy Frontier, but Etsu is also selling it through the Petit Jeuness store. Is it hard to buy from petit jeuness? I didn't actually use them, I ended up bidding on an auction and afterwards noticed it for sale there. You would have to use a deputy service to order and send it to you from Petit Jeuness, like most of these shops they don't ship internationally. Truely awesome...makes me regret that I passed on it all the while (since the last FRONTIER released art collection Cai was a real left-down besides the CARNELIAN cover art and info on REI @ FF) and here's hoping they still sell this next month at Jeuness.